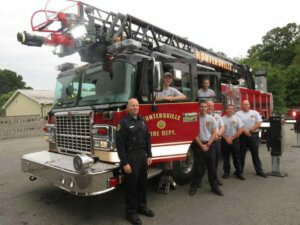 The Huntersville Fire Department recruits members who are N.C. Certified Firefighters who also have a N.C. EMT Basic Certification. Interested applicants should email: mauten@huntersvillefd.com. The applicant will be sent a follow up email with the pre-agility test forms and the dates of the Fire Department Physical Agility Test. This Physical Ability Test consists of four separate events that tests the applicants abilities to complete the daily physical requirements at the Department. This test is a sequence of events that requires the candidate/firefighter to progress along a predetermined path from event to event in a continuous manner. 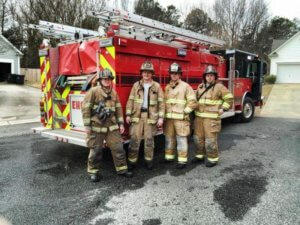 This test was developed to allow fire departments to obtain a pool of firefighters/candidates that are physically able to perform essential job tasks at fire scenes. This is a pass/fail test based on a validated maximum total time of 8 minutes. In these events, you wear a 50-pound (22.68-kg) vest to simulate the weight of a self-contained breathing apparatus (SCBA) and fire fighter protective clothing. This event is designed to stimulate the critical tasks of walking up stairs in full protective clothing while carrying firefighter equipment. For the test, you must walk up the staircase at a set stepping rate of 60 steps per minute for 3 minutes. During the test, you are permitted to touch the wall or handrail for balance only momentarily. However, if the wall or handrail is grasped or touched for an extended period of time, or if the wall or handrail is used for weight bearing, you have failed the test. This concludes this event. For this event, you must grasp a hose line nozzle attached to 100 feet of 1-¾ inch hose. Place the hose line over your shoulder or across your chest. Stop when you have stretched all 100 feet straight, drop to at least one knee and pull the hose line until the hoseline's 50-foot (15.24 m) mark crosses the finish line. During the hose pull, you must keep at least one knee in contact with the ground. This concludes the event. This event is designed to simulate the critical task of removing a victim or injured firefighter from a fire scene. This event challenges his/her upper and lower body muscular strength, endurance and grip strength. For this event, you must grasp a 165 pound mannequin under the shoulder(s) or bye the arms and drag it 25 feet to a pre-positioned marker, make a 180 degree turn around the cone, and continue an additional 25 feet to the finish line. You are permitted to drop and release the mannequin and adjust your grip. The entire mannequin must be dragged until it crosses the marked finish line. This concludes this event. This test establishes a guideline ensuring that all members up to and including the rank of Chief are fit for duty and possess at least the minimum physical abilities necessary to perform essential firefighter functions. HFD utilizes the Firefighter Related Physical Ability Test (FRPAT) as the test to determine “fit for duty” status - annually. The FRPAT consists of the following: During the entire test, the participant will wear full turnout gear including SCBA. Time runs continuously from start to finish. Begin breathing from SCBA, Pick up a high‐rise pack at base of stairwell (100‐foot section of 1¾ inch hose formed into a “soft pack”). While carrying high‐rise pack, climb stairs to the 3rd floor of the tower. Drop the high-rise pack in the breezeway. Enter into 3rd floor room off of breezeway. Advance to nozzle end of charged hose section (50 feet of 1 ¾ inch hose filled with water. Crawl on all fours the 25 foot L-shaped course while dragging charged hose section. When reaching end of course, pull the remainder 25foot of hose section across event line while remaining on at least one knee. Using the stairs make your way down to the second floor and enter the 2nd floor off of breezeway. Advance to the hose hoist at the wall on the 2nd floor. Hands over hand pull on the rope until the rolled 2 ½ inch rolled hose is advanced from the bottom floor to the top rail and onto the floor of the 2nd floor. Using the stairs make your way down to the open door on the first floor. This event is designed to simulate the critical task of removing a victim or injured firefighter from a fire scene. This event challenges his/her upper and lower body muscular strength, endurance and grip strength. For this event, you must grasp a 165 pound mannequin under the shoulder(s) or by the arms and drag it 25 feet to a pre-positioned marker, make a 180 degree turn around the cone, and continue an additional 25 feet to the finish line. You are permitted to drop and release the mannequin and adjust your grip. The entire mannequin must be dragged until it crosses the marked finish line.